Amazon is listing these 160-page youth books. Pinkie Pie has always been a bit different from her very serious family. When she plans a Ponyville "rock" concert to support the family business, Pinkie's family doesn't like the idea. They just want her to be serious, for once. This is a real problem! Read along as Pinkie gets a little help from her friends in this original and brand-new adventure! Rainbow Dash is a huge fan of the Daring Do book series, but after the newest book comes out, she's not alone! Suddenly, every pony in Ponyville is reading the books! To prove she's' the ultimate fan, Rainbow Dash decides to show her friends that she can be just as brave and "daring" as her hero. But Twilight Sparkle and Rainbow's other friends worry about how far she's willing to go. Just how daring should one pony be? Oh, and there's an EqG novelization from the same author this October. There will be activity pages, of course. They will also be on the Kindle, which is better for people shy about their affiliation with MLP. Edited by RC85747, 02 July 2013 - 04:16 AM. I'm assuming you meant Cadance and not Celestia? I wasn't paying that much attention. Sorry. Way to be generic with those covers. I didn't mean for that to come across as snarky. It's just we have two princesses whose names start with C.
"Maybe" is...disappointing. Granted, I'm mainly waiting on the Pinkie Pie book. The interesting part is that she was consulted about it. Edited by Fnu Aw, 21 March 2013 - 02:15 PM. 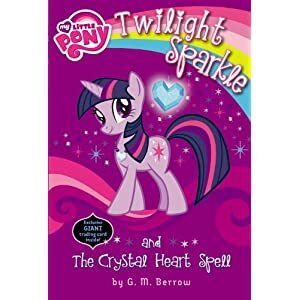 The Crystal Heart Spell novel is out. 2 Chapters in and I'm enjoying it. Yay! Now I can start looking for it. It's available on iTunes, $5.99. A bit cheaper on Kindle. 160 pages. Edited by Dvandom, 02 April 2013 - 09:05 PM. The characterization of Trixie is not canon with the current series, but everything else is spot on. The needed pop culture puns are there. 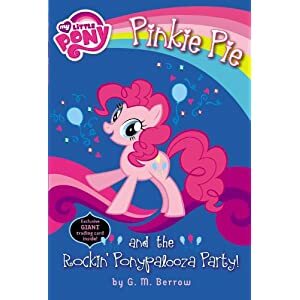 The Pinkie Pie book has been uploaded to Kindle. *UPDATE* Done. Great little thing. If you loved the first book's pop culture references, this one will knock your socks off. Edited by RC85747, 02 July 2013 - 04:02 AM. Wait, what order should i get these in then? They are listed in release order on the first post. They're pretty stand-alone, so it shouldn't matter. Just finished Crystal Heart Empire. It's pretty bad. Exactly the sort of writing-down-to stuff that the cartoon manages to avoid. Little girls might like it...but my nieces like Jar-Jar so that demographic isn't exactly demanding. Interesting that Cadance used to be pegasus before she was a princess. I've been touting the idea that any of the three types can become an alicorn, so I like this. Edited by Fnu Aw, 03 July 2013 - 03:32 PM. It certainly makes one think that the rest of the mane six might one day join Twilight in alicorn-hood as well.